Heat oven to 450°F. Unroll 1 pie crust in ungreased 9-inch glass pie plate. Press crust against side and bottom. Prick bottom and side of crust with fork. Bake 10 to 12 minutes or until light brown. Cool completely; about 35 minutes. Meanwhile, cut out small heart shapes from second pie crust. Bake them on a cookie sheet for about 5 minutes or until golden brown; cool. Dust with powdered sugar. Set aside. Slice a few chocolate curls or shavings from side of white chocolate bar; set aside for decoration. Melt the rest of the bar in a double boiler on stovetop or in microwave on Medium 1 to 2 minutes or until it stirs smooth; spread in the bottom of the cooled pie crust. Refrigerate 10 minutes. Place a 3 1/2-inch biscuit cutter in the center of the pie shell and surround with 2 cups halved strawberries. Fill the center with blueberries (about 1 cup) up to strawberry level. Place remaining strawberries in 2-quart saucepan with 5 tablespoons of the granulated sugar and 1 tablespoon of the water. Heat to boiling over medium-high heat. Crush strawberries. Strain the juice from the strawberries, and put about 2/3 cup of the juice back in the pan. Mix together 1 tablespoon of the cornstarch with 1 tablespoon water. Add the cornstarch mixture to the strawberry juice mixture. Cook over low heat about 4 minutes or until thickened. Spoon over strawberries and refrigerate for 10 minutes. Meanwhile, clean out the saucepan; add remaining blueberries, 5 tablespoons granulated sugar and 1 tablespoon water. Heat to boiling, and crush blueberries. Using the same procedure as with the strawberries, strain and return to pan with 1 tablespoon cornstarch and 1 tablespoon water that has been mixed together. Cook over low heat until thickened. Spoon blueberry mixture over blueberries. Refrigerate pie for 2 hours; remove center ring. 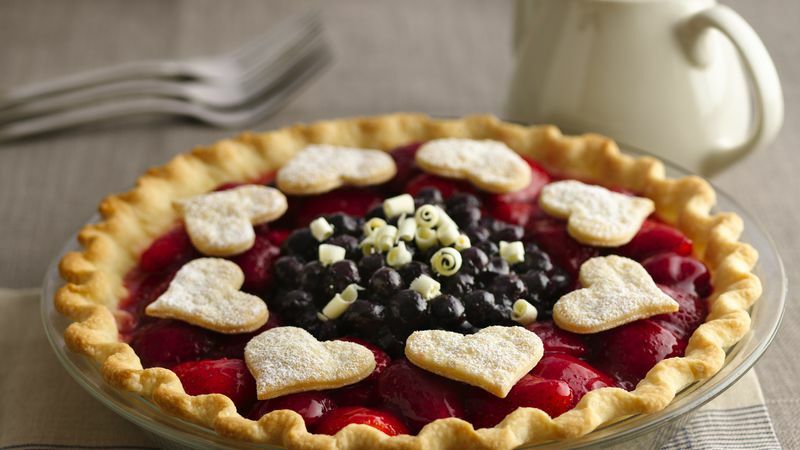 Decorate pie with pie crust hearts and chocolate curls or shavings. Awesome served with whipped cream, if desired. Make chocolate shavings by pulling a vegetable peeler toward you across a white chocolate candy bar. Press firmly using long, thin strokes.